DE HAAS MAASSLUIS BV – De Haas Maassluis B.V.
De Haas Maassluis specializes in the construction of new vessels as well as the complete maintenance, repair and renovation of patrol vessels, Search and Rescue (SAR) vessels, Incident Prevention Vessels (IPV) and other specialised professional vessels. Quality and service are at the centre of everything we do. Well-trained specialists at De Haas Maassluis deliver top quality craftsmanship that meets your requirements. We have the know-how, experience and excellent facilities to perform maintenance and repairs efficiently and to build vessels that comply with the latest requirements in the fields of environment and sustainability. Innovation is of paramount importance. By applying the best and latest techniques and materials, we ensure that the vessels we build for our clients are extremely reliable and offer maximum deployment possibilities. Moreover, costs can be reduced, for example, by bringing down fuel consumption or by reducing recurrent maintenance costs. Whatever your requirements, we will guarantee a perfect sailing solution. When entering Nieuwe Waterweg, De Haas Maassluis is the first shipyard one sees in the direction of Rotterdam harbour. This has been the case since 1879. And although much has changed in the world in the proceeding 130 years, the core values of that time still underpin our current activities: craftsmanship, customer focus and love for our profession. 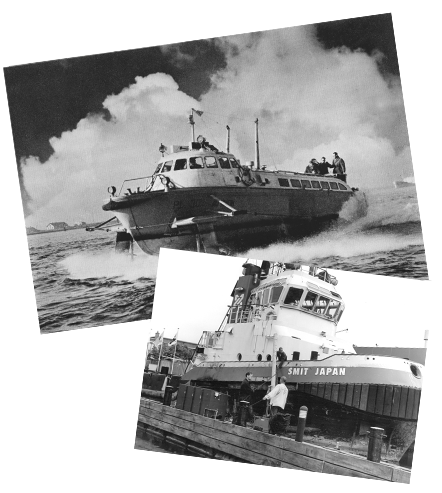 The history of De Haas Maassluis shows that the company’s original activities primarily focused on fishing vessels. These activities were later expanded to include other types of shipping. Throughout the years, many different vessels have left the shipyard after being built, adapted or repaired at De Haas Maassluis. These words characterise the rich history of De Haas Maassluis; a shipyard that has always looked to the future. This, for example, is demonstrated by the remarkable hydrofoil PL30 Aquavion, which was developed in the fifties and was way ahead of its time. Our shipyard is based at the perfect location – in the first harbour at Nieuwe Waterweg (from Hook of Holland), right in the heart of Maassluis. Thanks to this unique location, we can be quickly and easily reached by all ships with a draught up to 4 metres and a length up to 65 metres. The shipyard is also only a short distance from Rotterdam. This is one of the reasons why we have been blessed with so many professional clients from this region. Considering the nature of our activities, it is only normal for us to attach great value to sustainability. Many of our clients have high requirements when it comes to environmental impact and emissions, which almost goes without saying these days. Therefore, sustainability has become an integral part of activities at De Haas Maassluis. Although our shipyard complies with all applicable environmental requirements, we have gone a step further. For instance, we work in accordance with the ISO 14001 standard and the cradle-to-cradle concept, whereby we use as many recyclable materials as possible. We consider the environmental impact of every facet of our work. After all, sustainability is equally about people, materials and surroundings as it is about technology. At our shipyard we constantly implement clean technologies, biodegradable cooling agents and more environment-friendly solutions. For us, environment and efficiency go hand in hand, which means that corporate social responsibility does not lead to an unwanted effect on the prices, but rather to effectiveness. We are pleased to introduce to you the people in our company who you will have contact with, do business with, or who will work with you to manage of your projects. Every single one of them is an expert who stands for quality and with whom it is a pleasure to do business with. “A deal is a deal” is the motto that goes for them all!